Claymore was established in 1991 when the founding partners, who were medical practitioners, realised they could not change water into wine! They purchased their first 11 acre vineyard at Leasingham in the Clare Valley in 1991. The terra rosa soils (red loam) on a limestone bed, support 70 year old grenache, riesling and shiraz vines. The vineyard is non-irrigated with yields low averaging 1.5 to 2 tonnes per acre. They started making a little grenache, and a little bit of riesling in quantities which the ordinary family would finish in a few months. Claymore still produce limited quantities, but over time the Claymore range has expanded to include a wide range of premium Clare varietals, filling out this boutique winery's portfolio. In 1996, upon meeting a local identity nicknamed Bluey, Claymore Wines invested in the forty acre Kupu-kupu site at Penwortham, a premium vineyard which grows good quality shiraz, merlot and grenache vines. With brown loam soil over slate and very little surface water, just magnificent terroir for growing concentrated rich fruit, Kupu-kupu has become the Graceland of Claymore Wines, the home of many modern classics. The first commercial releases of Claymore began in 1997 under the possibly misguided premise that this could be a path to early retirement. Now almost 10 years on thoughts of retirement may be premature! Desparate lots of parched fruit are high maintenance, but Claymore have not looked back with regards to the quality of their award winning fruit. Non-irrigated, the vineyard yields only small volumes per tonne (no more than 2 tonnes per acre) but this is more than compensated for by the quality of the wines produced. 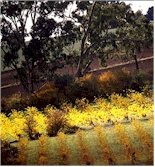 Claymore is a Clare Valley winery, a region with wine heritage dating back over 160 years, the first vines planted in 1842 by James Green, a servant of the districts pioneer John Horrocks. The region comprises a series of valleys with altitudes ranging from 300 to 500 metres. The climate is moderately continental with cool to cold nights and warm to hot summer days. Rainfall is predominantly in winter-spring (June to September) with an annual average from 430-630 mm. The average summer daytime temperature is 29 degrees, and 13 degrees in the winter. All the Claymore's grapes are sourced from their own vineyards in the Watervale and Penwortham region with some fruit coming from premium grape growers around the Clare Valley. Each Claymore release is titled after a favourite rock album of the winemaker, the wine often reflecting the melodies and rhapsodies of it's namesake. Claymore strive for excellence in the quality of fruit, processing limited yields of the most excellent possible material through a combination of traditional and modern wine making technique. Claymore's award winning editions including the Joshua Tree Riesling, the Dark Side of the Moon Shiraz and the Nocturne Grenache Shiraz. It is an amazingly satisfying experience to savour the flavours that capture the vibrance of these wines, made from premium fruits. The underlying philosophy at Claymore Wines is to keep things fun (something they admit to taking their fun quite seriously) but Claymore have always maintained similarly serious standards for their award winning wines, serious wine. Claymore's exemplary attention to quality has resulted in wide acclaim from industry peers, and around the wine show circuit.